Homemade super-mini croissant with Breast Cancer research wristband. Click here if you'd like to make a tax-deductible donation towards this great cause! It seems I've been doing quite a bit of fundraising recently. I relish any opportunity to cook and eat, and raising money for a good cause makes it even better! This brunch was a very relaxed affair, a lot more low-key than my Lunch for Leukaemia. After that other ill-fated lunch some weeks back, I was still not in the mood for an extravagant affair. Not only did we have a smaller group, but the entire menu could also be made in advance. (Including - gasp! 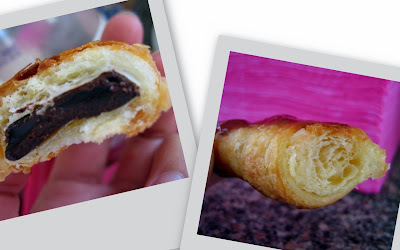 - my own croissants. Detailed post to come at some stage this week). On the day of the brunch, I basically just set everything out on the bench, and let people assemble and eat whatever they felt like. If I learnt nothing else from working at a café, it's that people love toasties. 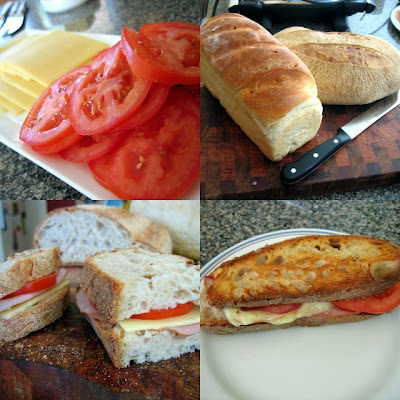 I bought a plain white loaf, and a rustic white sourdough, and laid them out with some sliced cheese, tomatoes and ham next to our sandwich press. Random spreads to go with bread in case toasties didn't appeal. Pink pink pink! My friend An brought yummy Nudie juices! Behind them is some merchandise for fundraising. The most popular were the pens and big pink nail files. Also check out the free pink paper napkins I got with my brunch pack. We didn't get through them all, not by a long shot. They'll be coming out the next time I have people over, muahaha. Latte made with You'll Love Coles brand coffee. (Again, free with the brunch pack that the Breast Cancer Foundation sends out). I put my bro on latte-duty, as he is much better with the machine than I am. Cranberry, Almond and Honey granola - from Nigella Christmas. It is similar to Andy's Fairfield Granola from Feast, but with cranberries instead of sultanas, and far less ingredients. Bizarrely, it tastes no less delicious. I made a double batch (a day in advance), and for some reason, it didn't get crispy in the oven. The recipe says to bake it for 40-50 minutes, until crispy, but even though it got browner, it stayed disconcertingly soggy. I left it in the oven for double the time, and took it out when it almost started burning. It was still soggy, but thankfully, crisped up as it cooled down. Next time I'd take it out of the oven as soon as it's brown enough. What we didn't get through at the brunch will be my family's breakfast for the next week or so. Yay! And now the pièce de résistance (or is that pièces de resistance? ), my croissants. I made some regular size, some super-mini (see first photo for proof), and a few pains au chocolat. Miam miam! I was really proud that they turned out decent-looking, and - yay - had lots of layers. If you would like to sponsor me and support this great cause, click here and then the "Sponsor Me" button. Big thanks to my friends for coming and supporting me, and for supplying delicious juice and fantastic company!! Welcome to post number 2 in my "3 Dinners" series. This week's theme is pasta! Quick, versatile, economical. All boxes ticked! This pasta dish, from Nigella's Forever Summer, is one of my staple dinners. It's exceedingly simple, if a little time consuming, as it takes 45 minutes for the zucchini to cook down to the requisite mushiness. You don't need to stand there stirring it the whole time, but I don't like to leave a pot on the stove unsupervised, so I'd stay in the kitchen, checking my email or cleaning up or whatever. Just slowly cook some sliced zucchini and garlic in a bit of oil, until soft and mushy, then add marsala-soaked sultanas and toasted pine nuts. Toss the whole lot through cooked pappardelle with some parmesan and parsley. Ta-dah! I used Passion Pasta's wholemeal spelt pappardelle, which was toothsome and satisfying, but not heavy. Nigella was right - 250g of pappardelle does seem like a small amount, but it was enough for a light meal for 4 people. Too easy. This pasta is my way of bulking up the classic spaghetti aglio olio, another favourite of mine, and I pretty much always have the ingredients for it on hand. I keep bacon in the freezer, a parsley plant in the garden, parmesan cheese in the fridge, and pasta in the pantry. Making this pasta is simply a matter of frying bacon pieces and garlic in olive oil, then tossing through the cooked spaghetti, parmesan cheese and parsley. I see in this photo I used a mixture of regular spaghetti and the remnants of a packet of spelt spaghetti, but whatever spaghetti you prefer would do the job. 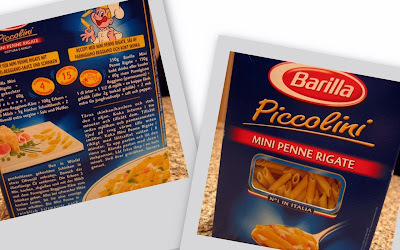 I love these little mini-penne rigate! How cute are they? I must admit I was drawn to the German writing on the back of the packet. It came with a recipe (in German) for mini-penne rigate with parmigiano reggiano sauce and ham. As far as my abysmal command of the German language would allow me, I figured out that the sauce is made from cooking milk with cheese, which you then add to the cooked pasta, with some chopped herbs and cooked peas. I tried it a few weeks ago, but wasn't too impressed. Some weeks later, however, I found success with a similar recipe in Nigella's Feast. Nigella's pasta is a lot more simple; her "pasta with ham, peas and cream" is just that. Cooked and ready to go in less than 10 minutes, and wonderfully tasty. As a bonus, making this recipe enabled me to use up a half-finished tub of cream I had in the fridge, which surely would have died a mouldy death, had this recipe not saved it. Welcome to a new series of posts where I share 3 meals I've made each week. In theory it'd be from the previous week, in practice, the meals could be from months and months ago. The idea is twofold: to get through my massive backlog of food photos, and to share ideas for meals that are interesting and varied, but still manageable for a busy (and keen) cook. This week's theme is Japanese. I found these recipes in a 2005 (!) issue of Delicious magazine. It was their "healthy" issue, and I picked it up off the floor of my room when I running late for work and could not bear the thought of reading the MX again. Lucky I did, because it was full of great recipes! These ones are from Jill Dupleix's column. The recipes are pretty easy, if a bit fiddly. I think you could do them on a weeknight after work, if you were organised, but I made them on a lazy weekend evening. (To be honest, that night my brother suggested buying KFC - and believe me I was tempted - but I thought better of it and decided to make something healthy). For the above veggies, you blanch them in hot water, drain them, then coat them in a mixture of miso/sugar/soy/mirin/sake, and grill them. For the chicken, you poach chicken breasts with shiitake mushrooms in a mixture of soy/mirin/sake/sugar and stock, then slice them and serve them on rice, with some wilted spinach and finely shredded carrots. Jill's recipe include enoki mushrooms also, but our local shops did not oblige. I was very pleased with these recipes, and thought the poaching technique was a great way to add flavour without fat. I'd definitely like to make this again. The grilled fish in question was this toroaji I got at Fuji-mart a while back with my friend Markii. I can't remember exactly what fish it is (mackeral, perhaps? ), but it is smoked and salted, and available in the freezer section. Markii enjoyed this fish while he was living in Japan, and it is apparently quite popular with Fuji-mart's customers. All you need to do to it is defrost and grill it. The recipe for the veggies below, come from Jamie's Cook with Jamie, and is one of my favourite ways to make plain green veggies more interesting. They are served with little fried slivers of garlic, toasted sesame seeds, and a dressing made of soy sauce, sesame oil, ginger and lime juice. Oishi~~i! Miso soup. Instant. Also from Fuji-mart. Also good. I enjoyed this meal overall, although I did find the fish very salty, so we only needed to eat a small amount to be full. Those above two pieces were more than enough for myself and my parents. I adore Japanese curry. As a Malaysian, I know that Japanese curry isn't actually hot, and therefore not a "real" curry, but I still love it. Beef curry, katsu curry (deep fried pork cutlet covered in curry sauce), or nasu karee (eggplant curry!) My host mother in Fukuoka made it for me back in '99 because she knew I love eggplants. And, because she knew I love hot food, she made it 3 times as hot as it normally is. I loved it! But I felt really, really sorry for my kawaisou host sisters who gasped like crazy, fanning their mouths and downing their water like nobody's business. Gomen-ne! Any Asian grocery store should stock Japanese curry mix. Don't feel bad about using a packet, that's the way it's done in homes all over Japan. You just cook it with beef pieces, potatoes, carrots, and (I think) a bit of water. Now, I didn't actually make this curry, my brother's girlfriend Su made it. (Arigatou Su, you are suupa~ kuuru!) But, I think it makes a great quick dinner, which is why I'm sharing it with y'all. The leftovers froze really well, and made a great workday lunch. This was the menu for an ill-fated lunch party I had a couple of weeks back, where 2 of my guests did not rock up (including the vegetarian for whom the menu was designed! ), and I sat in a huff for most of the afternoon. Ah well. The rest of us had a good time eating and catching up, although I must say the experience put me off entertaining, at least for a little while. The stuffed eggplants (first photo), were an adaptation of a recipe in Tessa Kiros' Falling Cloudberries - her version is stuffed with minced beef, I substituted rice. I'd never made stuffed eggplants before, so it was quite interesting for me to figure out how to do it. You start by disembowelling the eggplants (the recipe says to use a spoon, but I found a little utility knife much more effective), then boiling the shells for about 10 minutes until soft. In the meantime, you cook the eggplant flesh with some onions and rice, tomato passata and stock until the rice is cooked. Let it cool a little, add some parsley and feta. Then, you stuff the mixture into the eggplants, layer them in a lightly greased dish, pour over some tomato sauce, sprinkle with parmesan and bake! (I couldn't find animal-rennet free parmesan, but by the time I got around to baking, I realised our veggie guest wasn't going to show, so I sprinkled parmesan over the eggplants with gay abandon). Side dish of choice was my absolute favourite chickpea salad - at the insistent request of 2 of my good friends (who did come! ), who tried it at the Lunch for Leukaemia, and loved it! What can I say? They've got good taste. I served the meal with rice and lentils - 1.5 cups of rice, half a cup of puy lentils, which I simply put in the rice cooker with 4 cups of water. Too easy. Dessert - a must for my coffee-drinking government buddy was a grown-up version of the white mochaccino cupcakes I made for Fanny's Sugar High Friday: Cupcake event. Or more simply put, a blonde mocha layer cake from Nigella's Forever Summer. Going from previous experience, I halved the icing quantities so that I wouldn't have a huge amount leftover. The halved amount didn't make quite enough to cover the entire cake, but that's fine because it is verrry sweet. 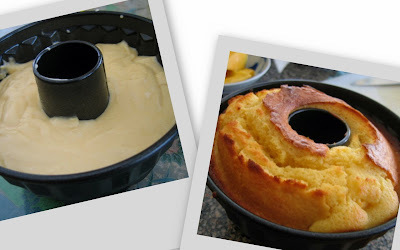 I have to say I prefer this cake in delicate cupcake form, but I loved the way it looked sitting on the kitchen table, all majestic and swirly. As far as the food was concerned, the lunch went quite well - the taste of each item was nice, and full of healthy legumey protein. However, in total the meal was a bit rice-heavy, and quite uniform in texture. My next challenge will be to get a bit more texture happening in my veggie meals. I do realise I am quite late jumping on the St. Jude's bandwagon, but I'm sure you'll forgive me. I went with my brother and his girlfriend on a lazy sunny Sunday afternoon. The last time I came here, a few years ago, it was Hideout. I came with some workmates because we couldn't get into Polly. (Not because we weren't cool enough, let me assure you, but because it was already nearly closing time). At Hideout, we had some nasty dips - straight out of a homebrand supermarket packet, I'm sure - with lukewarm Turkish bread. It was expensive, and a poor substitute for fancy cocktails in Polly's luxurious atmosphere. My brother was particularly impressed by the fit out and the cool 80's tiles on the bar. It reminded him of The Panama Dining Room, which we later realised, is run by the same team. I loved the bright, airy space. The huge amount of natural sunlight meant it was great for taking food photos. Our waiters were friendly, although I have to say I was slightly bewildered by the level of detail on the menu, which detailed the provenance of each of the main ingredients. To be honest, it was so much information that most of it went over my head, but I do remember that the jams were made by the kids as part of Stephanie Alexander's Kitchen Garden program. Love that chewy crusty bread! Again, note the cute 80's plates. As you might have guessed, the menu is designed for sharing. We ordered a lunch special, which includes soup, sandwich, glass of wine and sweet tart of the day. A bargain at $27. In addition, we ordered a drink each (some red for Dan's gf, sparkling wine for myself, G&T for the bro), a slice of a savoury tart (see first photo), and a mixed charcuterie plate. First up, rabbit soup. The meat was tender, and I enjoyed the tiny cubes of carrot and celery. I found the liquid itself had great flavour, but was much too salty for my taste. Charcuterie plate - prosciutto on the left, pork rilette (my favourite!) in the centre, prune and rabbit terrine on the right. This was served with some pear slices and more of that tasty sourdough bread. This was St. Jude's Reuben sandwich - corned veal silverside, brown bread, a mayonnaisey dressing and "sauerkraut". (The menu said sauerkraut, but it tasted like regular, non-sauer shredded lettuce to me.) Despite that, this sandwich was a real winner! I'm regretting that I didn't take more notice of the menu, because their bread was absolutely divine. The savoury tart of the day had a puff pastry base, and was topped with hazelnuts, tomatoes, peas and ricotta. Again, delicious. I thought the accompanying salad was fantastic - really fresh lettuce leaves (I think it was butter lettuce), with a few herb leaves in there and a strongly flavoured, slightly salty dressing. Making plain green salads truly delicious can be a challenge, and this was an absolute success. If only I could make dressing that good at home! We were quite full by this stage, but as we'd ordered that lunch special, we still had our dessert coming. The apple crumble tart came highly recommended by our waitress, especially as it had just come out of the oven. It looked inviting, but it was probably the disappointment of the day. The pastry and crumble were a bit powdery, and the tart had an overpowering flavour of cardamom. A slight hint would give a mysterious and alluring spiciness, but we found that the cardamom flavour just dominated the flavour. Not pleasant. As it was a long and lazy lunch, we finished with coffees. It was made very weak, much weaker than most coffees seem to come. I'm no longer a huge coffee drinker, but I'd still ask for a strong cappuccino next time. I thought St. Jude's was perfect for a relaxed sunny lunch. The total cost of the meal was $90 for 3 people. Quite good going, I think, considering we had drinks, and that our meals contained ingredients of such distinguished provenance. I love cookies. Big, fat, chewy cookies, choc-a-block full of chocolate and nuts. My favourite store bought ones are Mrs Fields, or Ben's Cookies in the UK - amazing. Apart from The Rock's favourite chocolate chip cookies, which are full of oatmeal for extra texture, I adore the classic chocolate chip cookie - just chewy dough, big chocolate chunks, and walnuts. I don't quite buy into that whole "ultimate" choc chip cookie thing. After much research and recipe comparison, I've come to the conclusion that all classic choc chip cookie recipes are pretty much the same. And besides, "ultimate" is a relative term. It's really up to you to make them how you like them. Do you like milk chocolate or dark? In big old chunks or little chips? Walnuts, almonds, or no nuts at all? Thin and crispy? Thick and chewy? When I'm in a super-cookie mood, I like to make up a batch of cookie dough, form them into appropriate cookie shapes, and keep them in an airtight container or freezer bag. ... and that way, freshly baked chunky chocolate cookies are never more than 15 minutes away. Extremely convenient, and very impressive if you're having friends over for a girls' night in, or even a proper dinner party. As Colin Cowie says, "Frozen, ready-to-bake chocolate chip cookie dough is a... fantastic option for a last-minute flourish!" On a more serious note, keeping the cookie dough in the freezer instead of baking it all at once means you're more likely to limit yourself to one or two. So it's a (relatively) healthier. Unless, of course, you go the whole hog and sandwich a scoop of ice-cream between 2 cookies. Cream butter with sugar, brown sugar and vanilla. Beat in egg. Mix flour with salt and bicarb; mix into creamed mixture. Stir in chocolate and nuts. Roll tablespoonfuls of mixture into balls, and press flat into cookie shapes. Place cookies on a tray, and place tray into freezer. Once cookies are firm enough to keep their shape, place cookies in a freezer bag or airtight container, sealing well. When it is cookie time, pre-heat oven to 180C (375F). Take desired number of cookies and place on a lined baking tray. Bake for 10-12 minutes, depending on your oven, until cookies are golden brown and cooked to your liking. Lift cookies off tray with a spatula, and leave to cool on a wire rack for as long as you can bear to wait. Remember that cookies will continue to firm up as they cool.